Chris Matheson injured his spine on his first pass at Sydney Dragway and was sidelined from further competition. The defending Top Bike champion made the final at round No. 1 last July at Darwin’s Hidden Valley, only to not pick up any points at the Sydney round in November. “This is a tough sport that shows no mercy,” said Matheson. One day you can be on top and the next fall down the ladder. Matheson lines up this weekend in Sydney hopeful to resurrect his points chase as he focuses on an unprecedented sixth national Top Bike title. 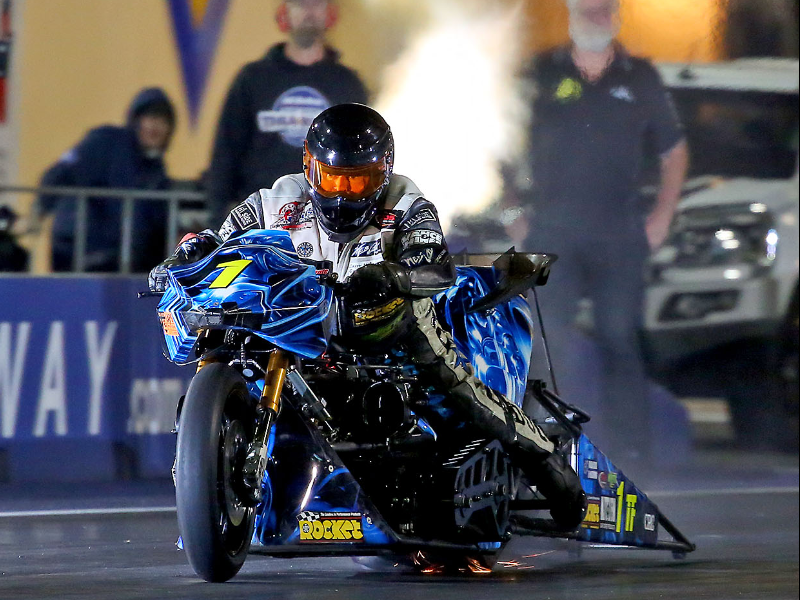 Matheson said he has been climbing the walls, literally trying to recuperate to the point where his spine can withstand the forces and challenges a nitro-burning 1500 horsepower Top Fuel Motorcycle represents. “The purpose was to bring together racers for a relaxed social get together before the big race. So please drop over at 8 pm for a cold drink and a bite to eat. The BBQ will be located at the front of the pits near the Sydney Dragway shed. Hope to see you there.